Today on Patreon I’m sharing something new: tips for getting started writing prayers and liturgy for your own congregation. Teaching liturgical writing is a new frontier for me, but seems to be a theme coming up for 2019. I’ve learned a lot these last few years, and turns out, I have a lot to say on the subject. So head on over to Patreon, and if you aren’t already a patron, it’s easy - a few clicks and you’re done. Speaking of teaching, I’ve been invited to team up with Brian Doerksen and Cindy Rethmeier to teach at a summer retreat for songwriters and liturgists. It’s in August in Abbotsford, B.C. There are 12 spots, and they’re by audition only. Check it out! Have a great week, and leave me a comment on Patreon! For the past 3 years, it has been my joy and privilege to produce hundreds of congregational litanies to the public, to the Body of Christ, free of charge on my website. My model has been: just be creative and serve the church. It’s been great - freeing, expanding, humbling! But it’s no longer sustainable for me to only do it this way. With the amount of time the writing takes, and the busyness of life in general, and the way my career is currently structured, I need to earn a living wage for the hours that I spend working. So. Starting in 2019, the majority of my weekly and monthly litanies will be available via Patreon. As I’ve gone along, I’ve more and more embraced my own identity as an artist and creative. Patreon is a blessing for artists. (What is Patreon?) It is a way that fans can participate in the work of their favorite creators. It’s actually a beautiful model of partnership, and a way that people who don’t necessarily consider themselves creatives can support and participate in the creation of beauty in the world. I will still offer a couple of free litanies per month here on my site, but the bulk of the work will be accessible via subscription. If my work has been a blessing to your community, and you value its continuing, I invite you to join in on it by becoming a patron. For less than the price of a latte per month, you can see all or most of my offerings. And you can help me make it so that I can keep on creating and actually start to cover the cost of creating, and so the Church can keep on praying these prayers. This work is alive and dynamic. I’m responsive to current events, to what society is experiencing, and of course to the ancient resonance of the Lectionary. 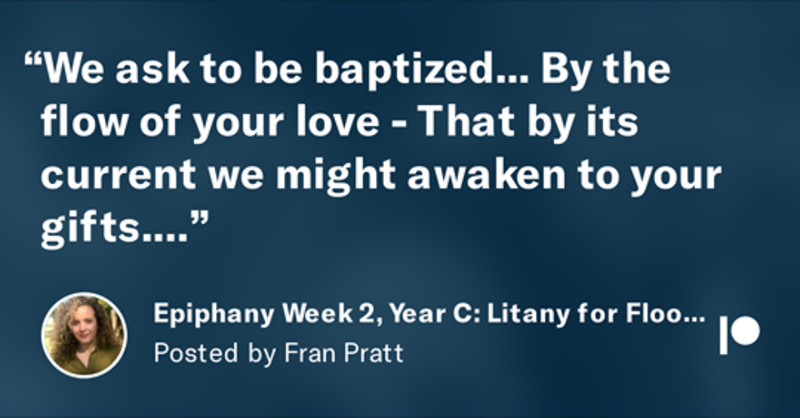 I’m so jazzed by getting to create liturgy that is relevant and timely, but also ageless and timeless. I’m just getting started, folks! Also, don’t forget to grab a copy of my new book, available in paperback and kindle! The catalogue of work that’s available here will, for the most part, remain. If you have questions about the changes I’m making, please email me via the contact page, or send me a message on facebook. As always, I’m sending you all love and light. I wrote Litany for True Power for our Beatitudes series at Peace of Christ Church. You can hear the sermons here. If my work is of value to you and your community, please consider becoming a patron on my Patreon page. Many, many thanks to those of you who support this work there. I recently sat with my grandmother in the last days of her life. My mom and I were there holding her hand as she took her last breaths. It was a profound experience that has brought me to think about all the forms grief takes, and my own experience of grieving - how unpredictable it is, how sometimes consuming, how suddenly past only to reappear again. We grieve events, losses, trauma, time passing, people passing… and I’m coming to believe that grieving is not just some mental or emotional space that we are plunged into by life events; it is also a skill we can practice and hold space for. And the only way to get through this life whole is to learn the skill. If we can’t accept pain and process it through appropriate grief, we will be constantly resisting the experience of life. Through grief, we learn to integrate experiences we (dualistically) judge to be “good” and “bad”, bringing them into wholeness. The more life I experience, the more I’m convinced that learning to hold the tension of grief is as powerful a life skill as, say, positive thinking or good communication or self-care. Here's a prayer for skill-building, available on my Patreon page. If my work has value to you and your community, please consider becoming a supporter on Patreon, where you get access to exclusive litanies and content. This month’s Patreon-only litany is Litany for Grieving.